· Make sure the card is inserted correctly – blue side uppermost, little yellow house to the front, gently pushed up to the end stop. Under normal circumstances there should be no need to access this menu, and making changes (especially to “LNB Setup” and “Default Transponder” may prevent the system from working normally. 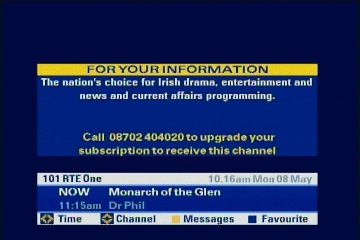 Check all connections to and from the dish and digibox for continuity. · If the message occurs on BBC, ITV, Hallmark, E4 or Disney channels, then your dish is not large enough for the area you live in (these channels have a weaker signal in much of Europe and require a larger dish than most other Sky channels. Note – it is often the case that identifying and fixing the underlying problem does not cause the message to go away – you may need to re-set the system by disconnecting and re-connecting from mains power. This message always appears when a system is first switched on from cold (powered up), re-set or has received a software download. It is purely for information only. Simply pressing “Backup” on the remote control will remove the message. There is no technical need for a telephone connection to a Sky system, although it may be a contractual requirement on new systems or “Sky Multiroom” configurations. This message is simply to encourage you to connect the line, which is used for interactive services such as banking, shopping and games play,. Live TV Pause (Sky+ only). Part of the Sky system setup – accessed by pressing “Services” then “4” (System Setup)” and “1” (Picture Settings” on the remote control. 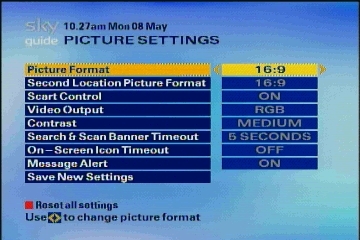 · Picture Format – set to the aspect ration of your connected TV – options are 4:3 (standard), 4:3L (standard, but in letterbox format for widescreen transmissions) and 16:9 for widescreen. 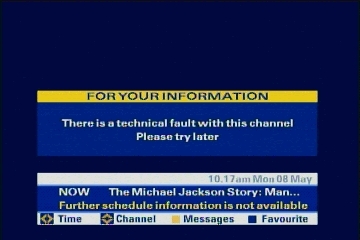 This message appears on both Sky and Sky+ systems. 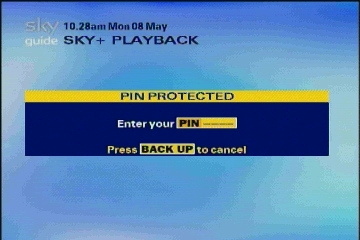 The Sky+ system message is shown here following an attempt to playback PIN protected content. Parental control settings (“Services”-“3” on remote control) can be used to protect live or recorded content according to broadcast rating. In order to watch such material a 4-digit PIN-code must be entered from the remote handset. 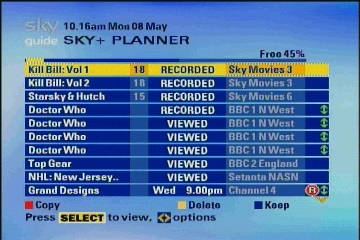 Note that with Sky+, in the case where restricted content has been recorded (e.g. late at night) but played back at a different time of day, it may be necessary to enter the PIN. · Sky keep records of PIN numbers and can be consulted if the number is lost. This message always appears when a system is first switched on from cold (powered up), re-set or has received a software download. It indicates that the system is loading channel and programme information. While listings are downloading the system cannot be used. The download usually takes 3-4 minutes maximum. If the message stays longer then there maybe a system, cabling or dish fault. 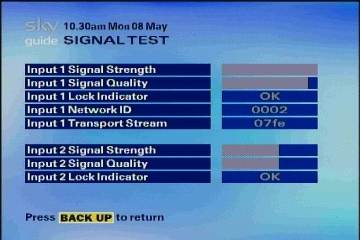 Note that if the banner at the bottom of the screen shows the correct day an (UK) time then there is a good chance that dish connection and alignment is in order, as this information only comes from a correct signal input. If correct time and date do not quickly appear there may be a problem with dish, alignment or cabling. 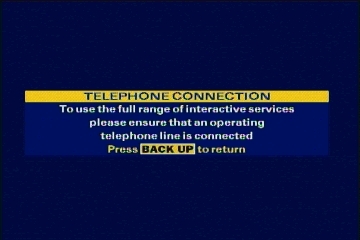 If this message appears while watching TV this may be an indication of a system crash, as the system is re-setting itself, as sometimes occurs during periods of bad weather such as electrical storms. · Signal quality – digital quality of the signal – a measure of how many errors are detected in the digital stream. Ideally should be 70% or better. · Lock Indicator – “OK” or “Not Locked” indicates that the system has locked onto an acceptable signal. The signal strength and quality indicators are a good, but approximate guide to correct dish alignment. These measurements are not useful if you are trying to optimise alignment to pickup the weaker BBC/ITV signals as they are measuring a different frequency on a different satellite. 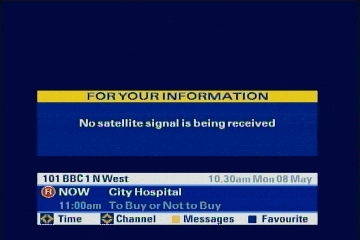 · Good strength and quality but no lock indicator - Probably another digital satellite, but not the correct one for Sky! When using these indicators to align a dish (which is not really a good idea in the first place!) it is common for the displays to freeze and/or become inaccurate and therefore misleading, so the system should be regularly power-cycled between dish movements to refresh the software. Sky+ systems have two connections to a dish, which is why an “Input 2” measurement is available. This must have similar readings to “Input 1” otherwise the record function will not be available. 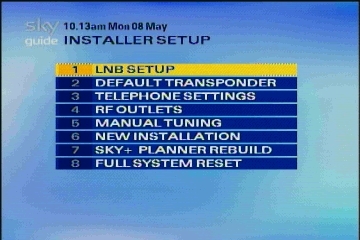 Part of the Sky system setup – accessed by pressing “Services” then “4” (System Setup)” and “5” (System Details)” on the remote control. Displays important system information. This information is often requested by your service provider to check the system is functioning correctly and internal software is uptodate. NOTE TO WEBMASTER - we should change or obliterate card and serial number in this picture! Accessed by pressing “TV Guide” on the remote control or box front panel. 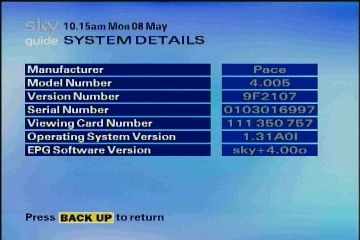 This is the top level access to the Sky Electronic Programme Guide (EPG). 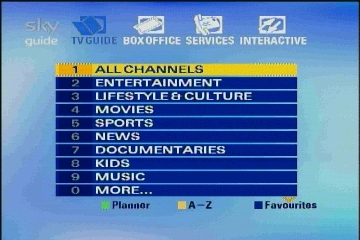 Numbered buttons access programme categories, coloured buttons provide channels sorted A-Z, access to the programme planner or selected favourite channels. Tip: If you loose your remote control or it has failed, and you need to access Digibox service functions, then press “TV Guide” on the front panel of the Digibox to reach this menu. Use the arrows on the front panel to navigate to “Services” and press “Select” to access the same menus you normally see then the “Services” button is pressed on the remote. 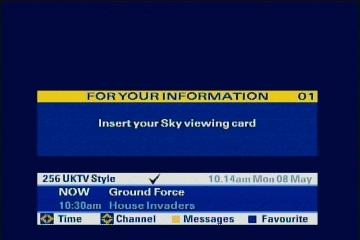 Accessed by pressing “TV Guide” then the green button on a Sky+ remote control. Implies a general reception fault, usually related to poor signal strength. This fault commonly occurs when reception (signal) strength is marginal, but not quite enough to provide a picture, and is often seen during storms, heavy rain, when snow settles on the dish, etc. Usually the fault quickly corrects itself as the signal returns, but may often require a re-set (power-cycle) of the system. 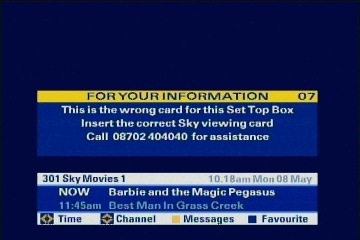 Indicates that the inserted Sky Card is not matched to the Digibox it is being used in. 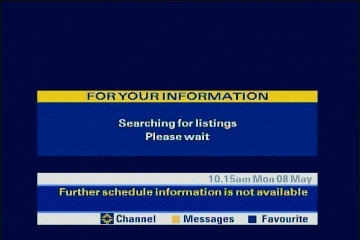 This message is normally seen on Sky premium channels (e.g. Movies and Sport) when a card is inserted that has not been enabled (paired) to that system. If the card is (or should have) an active subscription then your service provider needs information to pair the card correctly to the system (See “SYSTEM DETAILS”). Questions will certainly be asked about why the card is not in, or has been moved from the system to which it was originally paired (e.g. the previous box failed or is being upgraded to a better model). This message is also often seen when a Free-to-View viewing card (for Channel 4 and five) is being used (and will work), but Sky premium channels are selected. These would not be expected to work with such a card in any case.